This manual summarises the results of the latest research in the field of vascular access of the haemodialysis patient. 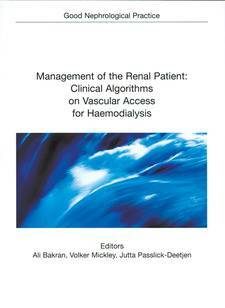 It contains a series of algorithms designed to guide the nephrologist through the different options for the patients’ vascular access. The handbook shows the various problems that may occur with the specific access and demonstrates how to deal with one of these particular situations. The comprised flow-charts offer a fast overview of the most important steps, while the accompanying text provides more detailed background information, evaluating the results of research and supporting the recommendations on the patient’s management. In addition the evidence level for the literature enforcing those recommendations is shown.